The event is SOLD OUT. If you would like to be added to our waiting list for tickets, please email sara.brown@ifopa.org. Thank you. Ashley was born in 2002 in Cary, North Carolina. Like most children with FOP, Ashley was in almost every respect a normal child at birth except for the big toe of each foot, which were malformed. It appeared as though Ashley was born with bunions. In fact, the doctors diagnosed her with "congenital bunions". When she came home from the hospital she was fitted with toe braces and prescribed a routine of physical therapy to try to straighten her toes. It was only later that we learned that the malformed toes serves as an important early sign of FOP. When Ashley was six years old she broke her leg in a skiing accident. The orthopedic surgeon who treated her for the fracture noticed unusual growths on her leg and hip bones. We were referred to a specialist who diagnosed the growths as multiple osteochondroma, a bone condition where bone tumors grow at the growth plate areas. This condition must be monitored for life as the bone growths can possibly break off, become so large that they limit joint movement and exert pressure on nerves and surrounding tissue and, in later years, may become cancerous. This condition required Ashley to be seen at the Hospital for Special Surgery (HSS) and Memorial Sloan-Kettering Cancer Center on a regular basis. 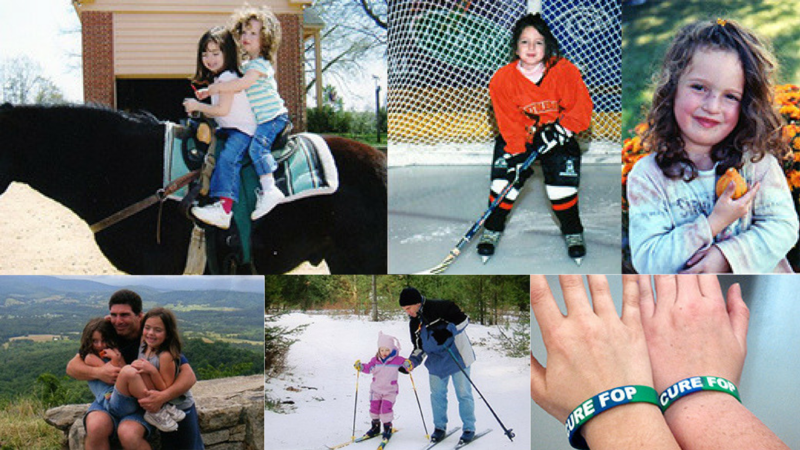 Through it all, and long before her diagnosis with FOP, Ashley participated in many activities including judo, tae kwon do and ice hockey, but she especially enjoyed playing soccer. As a family we were very active and often hiked, camped and skied together.